Late last year, the R.I. Habitat Restoration Team reconvened after something of a hiatus and, among other things, decided to establish several habitat-specific working groups to work on fostering more and better restoration--whether through planning and prioritization, policy and legislative recommendations, or other means--each group will determine its own areas of focus. Rachel Calabro of Save The Bay and I will be chairing a R.I. Rivers Restoration working group. Our first meeting will be held on Thursday, Feb. 10, from 10 a.m. to noon, in Room 280 at DEM headquarters, 235 Promenade St., Providence. The meeting is public and open to anyone with an interest in the subject. Though our focus is primarily on Rhode Island, those from other states which share watersheds with R.I. are encouraged to attend. --Assess river restoration needs & issues in R.I.
--Identify or begin to identify actions the group can undertake to promote and improve river restoration in Rhode Island--policy, legal, scientific, planning/strategic, etc. --Any other related business you'd like to put on the table. I will be compiling a rough list of issues for discussion; please send me any you'd like to add, or additional agenda items as need be. Or feel free to call me for more information. Hope to see you on the 10th! Annual Meeting on January 11, 2011! We are pleased to welcome Deborah Gist, Rhode Island Commissioner of Elementary and Secondary Education who will speak to us about the relationships between Environmental Literacy, STEM, and Race to the Top. Refreshments will be served $5 for 2011 RIEEA Members $25 for everyone else – 2011 RIEEA membership included. Register using the attached form (Organizational Memberships detailed on registration form). Get ready for Newport Biodiesel at NESEA RI tomorrow – Tuesday, December 7. Newport Biodiesel is one of the top five sustainable biodiesel producers in the United States and the largest in New England. Update – Nat Harris, founding member and production manager at Newport Biodiesel, will be joining us instead of Chris Benzak. Nat has had a life long interest in the automotive and marine industry. His career has spanned working in maritime related nonprofits to Porsche and BMW restoration shops. He is an avid boater and lived aboard his 52’ Irish Trawler for three years with his wife Jennifer and two children while managing a marina in Southwest Florida. The Northeast Sustainable Energy Association (NESEA) is committed to the adoption of sustainable energy practices in the built environment. NESEA RI is the local chapter for this organization. To learn more about NESEA - www.nesea.org. 6:30 p.m. Coffee & Dessert reception, organizational displays. By: Christopher Neill, Senior Scientist, The Ecosystems Center, Marine Biological Laboratory, and Director of the Brown-MBL Partnership and Brown-MBL Graduate Program in Biology and Environmental Sciences. Coastal plain ponds occur in kettle-hole depressions and reach their greatest abundance in coastal southern New England. Here, fluctuating water levels along pond shorelines maintain a diverse flora that contains many rare plants found only in these ecosystems. Such a delicate balance of land and water is threatened by groundwater withdrawals, nutrient loading from surrounding watersheds, and climate change-driven water level changes, among other considerations. Come explore with Dr. Neill factors that contribute to or threaten the very special shoreline plant communities of southern New England’s coastal plain ponds. Do you want to get the most out of your Point and Shoot camera and perhaps win a place in the RIRS Photography Calendar Contest or the ARS Photo contest? Perhaps, you just want to document your own garden and have a true representation in photos of its beauty. Come to the meeting this Saturday for hands-on expert advice from professional photographer and Rosarian, Dave Candler. Dave will cover it all from the practical to hands-on advanced creative photography. FIRST we will spruce up the garden under the leadership of the Garden Chair, Andy Vanable. Please bring your cameras, manuals, tripods, photo equipment, and, of course, your pruners, rakes, shovels, insect repellent. See you Saturday with your cameras. JOIN US FOR OUR ANNUAL DINNER: IT’S A BARBEQUE! Geoff Gaebe, owner of Addieville East Farm, has again invited us to enjoy this amazing retreat located on over 900 acres in northern Rhode Island. Addieville is considered the premier pheasant hunting preserve in New England. It also offers fly fishing, sporting clays shooting and 3-D archery as well as hiking, bird watching and a chance to observe a variety of wildlife. Come explore the peace and tranquility of the woods while learning about the history of the farm. Join our host and explore historical cemeteries, farm sites and a property that has over two hundred years of history. The free tour will begin at approximately 4:00, weather permitting. Take advantage of a great opportunity—our guests are invited to shoot sporting clays at 4:00 for an additional charge. Space is limited. Call the NRICD office (401)949-1480 to discuss shooting options and to make reservations. NRICD is proud to offer locally raised meats supplied by members of the RI Raised Livestock Association (RIRLA) as part of our menu and we are very excited to partner with More than a Meal—a catering business operated by Amos House. They will be preparing our BBQ again this year. Our thanks to RI Rural Development Council who subsidized the purchase of locally raised meets as part of a grant to promote farmers markets in RI. The Northern Rhode Island Conservation District fosters a community-based approach to the stewardship of northern Rhode Island ‘s natural resources through education and outreach into the communities, technical assistance and partnerships with other agencies. It’s that time again for the next NESEA RI meeting on Tuesday, September 1 at 6pm. Calling all Past, Present, and Future NBS Campers and Staff! Thursday, July 16 - 6:00-9:00 P.M.
Join us for a catered dinner and a chance to reminisce with friends new and old. Best yet, proceeds from the evening will help to support the NBS education scholarship fund! · Nature Crafts, Live Animals, S’mores - and more! Visit www.NormanBirdSanctuary.org for more information and to register. Tickets are $20 for adults in advance, and $25 at the door. Children under 13 are $5 each. 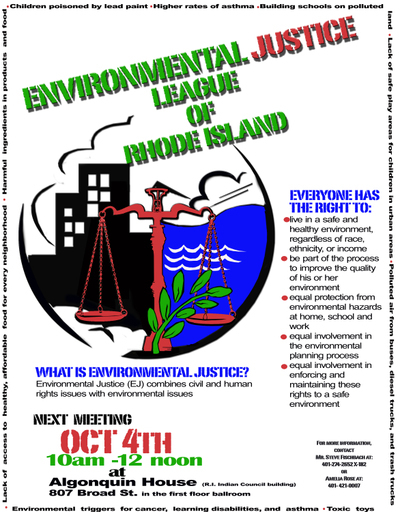 The next full group meeting of the Environmental Justice League of RI. The meeting will take place on Saturday, Oct. 4th between 10AM and Noon at Algonquin House, 807 Broad Street in Providence. The John H. Chafee Conservation awards will be given out on Friday May 9 at the dinner at the Providence Marriott. All ECRI members and Friends are encouraged to attend. Tickets are $60.00 for a local foods dinner and ceremonies. For reservations please contact the ECRI office ASAP, contact information below, as we need to finalize dinner counts very soon. As it is after Earth Day, we can now reveal the winners. The John H Chafee Conservation Leadership Award for 2008 goes to the Little Compton Agricultural Conservancy Trust for its preservation of 5 parcels, totaling more than 300 acres in the last year. Scituate High School for its Community Energy Conservation Program lead by ECRI member and Scituate HS science teacher Shannon Donovan. Hope all of you can join us on May 9 to honor these outstanding projects.